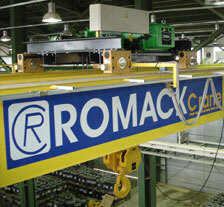 Romackcrane, is a leading company in lifting business that offers a complete range of advanced lifting solutions to many different industries worldwide. Here in ROMACKcrane, we believe in a culture with which we are dedicated to improving the efficiency and performance of businesses in all types of cranes. Being supported by our famous partners and well trained staffs, we always try to do our best to providing our customers with high quality products and vast and well served services. Innovative and technically skilled employees constitute our key resource for creating growth and being number one in the crane industry.